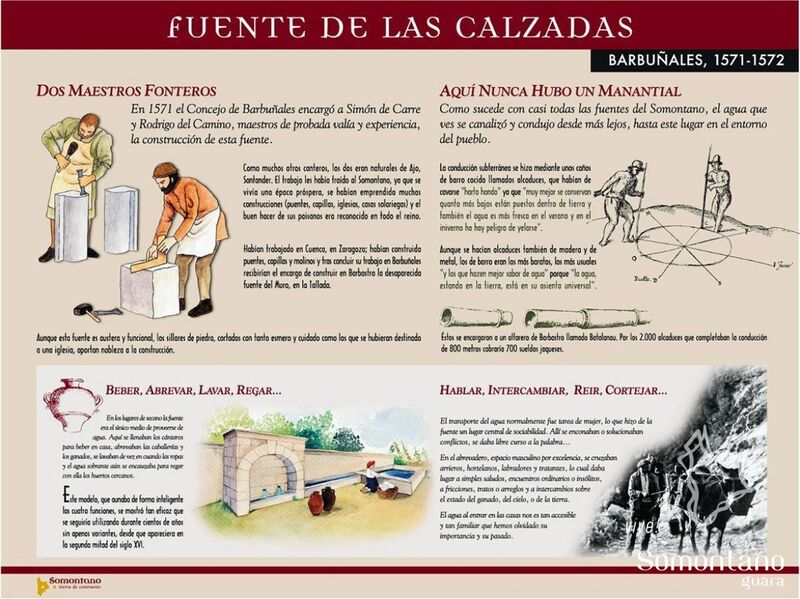 In 1571 the Barbuñales council commissioned Simón de Carre and Rodrigo del Camino to build this fountain. Like many other stone masons at the time, they originated from Ajo in Santander. Work had brought them to Somontano during this prosperous era and as a result they went on to undertake many other projects in the area such as bridges, chapels, churches and ancestral homes. The quality work of their fellow countrymen was already well known throughout the kingdom. 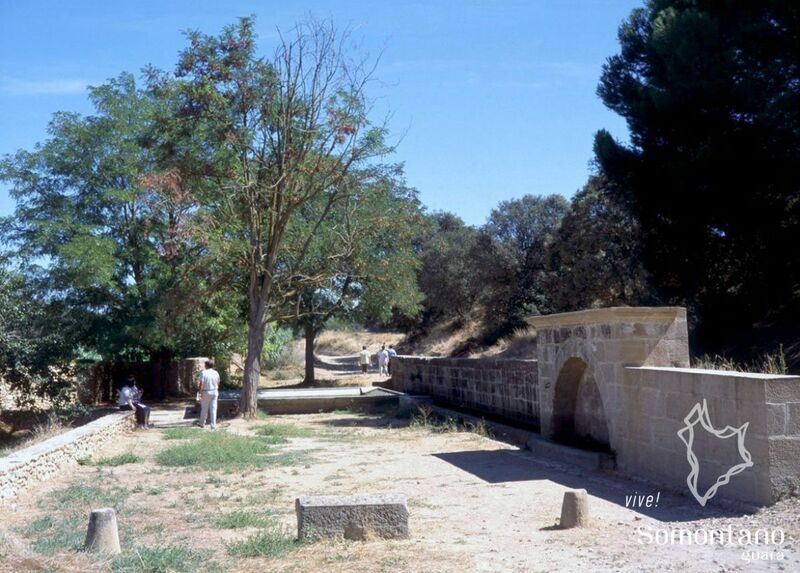 They had previously worked in Cuenca and Zaragoza and once the fountain in Barbuñales was complete, they were contracted to build the "Fuente del Muro" in Barbastro, sadly no longer standing. Although this fountain is austere and functional, it is evident that the stone ashlars were cut with as much care as if destined for a church and bring nobility to the construction. This model brings together the four elements of the traditional fountain in an intelligent manner and this design proved so efficient that it was used for centuries without variation. 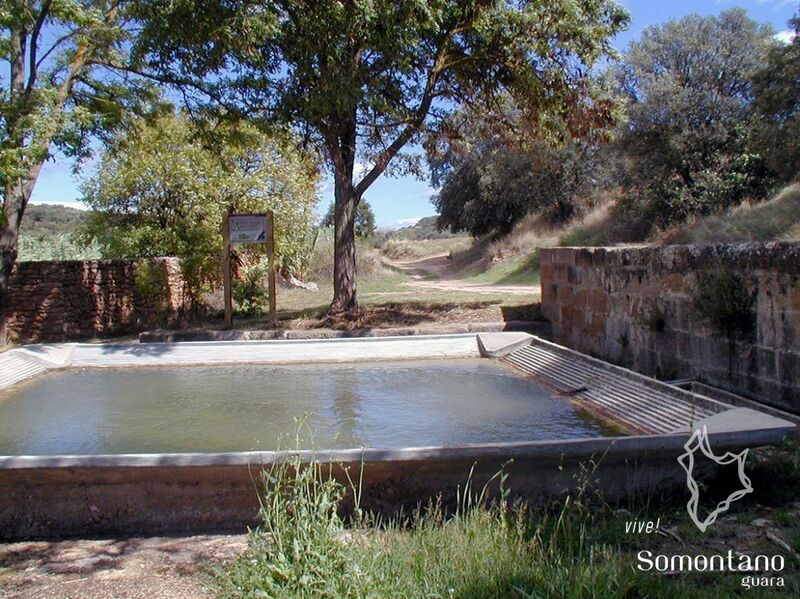 As is the case with all the fountains in Somontano, the water was channelled from afar to the environs of the village. Underground channels were made of fired clay pipes, which had to be sunk deep into the ground. It was said that the further underground they were, the longer they lasted, and, in addition, the water was cooler in the summer and in less danger of freezing in the winter. These pipes were made by a potter from Barbastro called Batlanau. For the 2,000 pipes he made to complete the 800 metres of channel, he was paid 700 jaqueses, a coin used in Aragon at that time. In areas as dry as these, the fountain was the only way of obtaining water. It was here that villagers would fill pitchers to take to their homes, water their horses and livestock and wash their clothes. Water that was left over after these needs had been met was used to water the nearby vegetable plots.